Many people have to travel for work, and often this travel is by car. 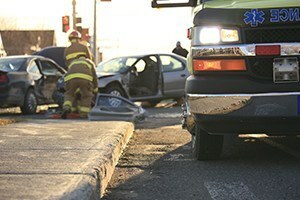 Workers' compensation benefits may be available for injuries arising out of car accidents on the job. These claims are particularly common among employees who drive for a living, such as deliverymen. At Pulgini & Norton, our workers’ compensation lawyers can examine whether a Boston employee may be eligible for benefits, based on the specific circumstances. The workers' compensation system in Massachusetts is designed to assist employees who are injured or made sick on the job. Benefits are awarded without considering who is at fault. Many workers die every year in vehicle accidents on the job. Some common injuries occur to the neck, back, knee, shoulder, and elbow. Closed head injuries are also common. Employees who are hurt in car accidents on the way to a job at a fixed office, or leaving it, are not eligible for workers' compensation under the "coming and going rule." This rule can prevent some employees from accessing benefits because insurers may try to frame a car accident injury as one that occurred while the worker was coming to or going from a job site where he or she works fixed hours. However, when an employee is injured while traveling for work or while actually on the job, he or she may be able to receive workers' compensation benefits. If an employee works away from the office, there are two factors considered in determining whether benefits are available. These are whether the employee was being paid at the time of the accident and whether the employee was reimbursed for the cost of travel between home and a work site. These factors are straightforward in the case of a pizza delivery worker who is rear-ended while delivering a pizza as a job duty. If the pizza delivery worker is disabled by a severe crash, he or she likely can recover benefits. Since workers' compensation benefits are provided regardless of fault, with some exceptions, he or she can probably establish eligibility even if he or she was speeding at the time of the accident and would be considered partially responsible in a personal injury lawsuit brought in civil court. If an employee is reimbursed for the cost of travel or is paid at the time of the car accident, injuries are also likely to be considered compensable. For example, when a physical therapist provides in-home services as an employee of a larger company and does not work from an office, his or her job duties may include driving to clients' homes to provide physical therapy. In that case, the injuries from a car accident driving to a client's home may be compensable. Another exception to the coming and going rule consists of car accidents in a company parking lot. If a car accident occurs in an employer's parking lot and the employer has a legal duty to maintain the lot or requires the employee to work there, workers' compensation benefits may be available. If you are temporarily or permanently disabled in a car accident on the job, you may be eligible for disability benefits, medical care benefits, and other benefits depending on the extent of your injuries. If the accident is due to another driver's action, you may also be able to sue the other driver for damages that are more substantial than what is available through the workers' compensation system. The experienced workplace accident attorneys at Pulgini & Norton can advise people in the Boston area on whether they may be eligible for benefits and represent them in their claims. We also assist individuals in Weymouth, Braintree, Hyde Park, and other cities in Massachusetts. Call us at 781-843-2200 or contact us via our online form for a consultation.